Project Co-ordinators Sharon Tanner and Matt Partridge outlined the aims of the project and demonstrated some activities with pupils from Milton Abbot Primary School, Holwell Primary School and Pilton Community College in Devon. "This is an excellent project, and shows how development education contributes to the broader curriculum. I was very impressed by the way the project integrates development issues with language, geography, as well as multicultural work." Also, Chris Wakely, Languages Adviser for Devon, highlighted the importance of language learning for Primary age pupils and finally, Badia Coulibaly, Vice-Chairman of the Malian Community Council, based in London, spoke about Mali and the development work of the Mali Community Council. Guests were then treated to live music from acclaimed kora player Sona Jobarteh and tasty refreshments in the form of traditional Mali Yam chips with chilli sauce and Devon cream teas! 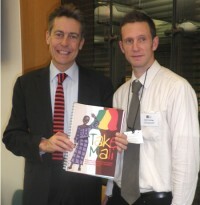 One guest said: "It was a privilege to attend the highly successful launch of 'Take Mali'. It was also clear from talking to a wide mix of people there how much enthusiasm and excitement the resource has generated. I believe Take Mali can give teachers confidence and young children opportunity to enjoy a positive learning experience in these areas that will significantly enhance their education and influence future attitudes to social justice and global citizenship." Building on the success of Take Mali, Devon Development Education are now focussing on Fairtrade Fortnight 2011 which runs from 28th February until 13th March, when Devon has invited a Malian Fairtrade Cotton Producer to come to Devon. the Take Mali resource has units of work on Fairtrade cotton and making traditional 'bogolon' cloth.